The purpose of this website is to promote use of on-board battery power and radio control of locomotives (and similar traction equipment) modeled in HO, On3, On30, Sn3 and S scales. The motivation for combining battery power and radio control is to eliminate all, or at least the most inconvenient aspects of, wiring and operating a layout based on track power and communication. The most important result is more reliable operation. What's new about the site is currently available technology has reduced the size of batteries and electronics to a point where these components can fit in smaller-scale models. The style and content of the website aims to create a modeler-to-modeler resource that explains S-CAB as a system to implement radio controlled, battery powered, HO-sized model trains. I hope to address both the why and the how-to of battery power and radio control from my perspective. I've developed a number of products along the way and am happy to sell them at low margin to fellow modelers. However, selling merchandise is not the primary objective of this website. The technology I'll describe does not reinvent model train control. It expands use of existing model railroading products and standards, including NMRA (National Model Railroad Association) standards for Digital Command Control (DCC). I'm an engineer. I see no point in building or operating a model railroad that is not reliable. Locos stuck on track dead spots, decoder drop-outs and rebooting, short-circuits traversing switches . .
​I'm also lazy. I don't enjoy cleaning track and wheels. I prefer to avoid working on wiring under a layout. In engineering language, the term "DCC friendly switches" just tells me there's a potential problem. Most important; improve reliability of model railroad operation. ​Achieving both objectives, requires an alternative to communication through the rails. To make it all work, we need a hand-held controller. We're not talking G-scale or garden layouts. Small means HO, Sn3, On30, etc. up to as large as S-scale. ​Sorry N-scalers, we don't yet have nano batteries. Since radio is the best choice for communication, our model needs a radio receiver and some sort of controller. Decoders are the controllers most familiar to model railroaders. We can bypass a whole lot of clutter if the controller contains a transmitter communicating directly with a receiver in our model. ​An S-CAB throttle operating an Electric Multiple Unit (EMU) using radio control. It's 2017, and, as I work on this update, it's becoming obvious that my focus is more and more on battery power. ​"Cab" also has a broader connotation in railroad terminology. In real locomotives, cab is the compartment which accommodates crew and is the location from which they operate a locomotive. Planes have cockpits; locomotives have cabs. 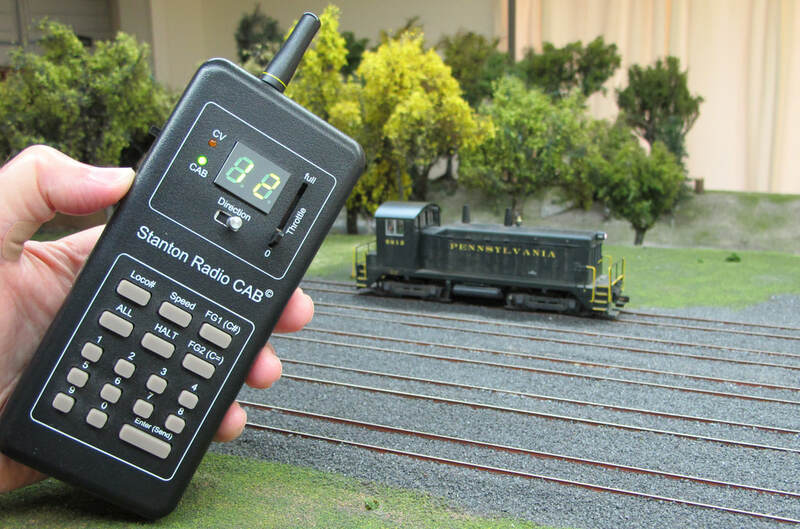 Hand-held controllers used to operate model trains are often called Cabs or throttles. References to various manufacturers and their products are scattered throughout this website. Their proprietary rights, trade marks, copyrights, etc. are acknowledged. The how will be a lot easier if we have suitable products. So far, it's been a 10+ year journey and, as I said earlier, I have developed a few products along the way. Before I introduce these products, let's take a broader view of technology and possibilities. For batteries, we'll use lithium-polymer (LiPo) cells, which have a nominal voltage of 3.7 volts. Battery pack implies more than one cell and series-connected means cell voltages add. For example, 3 cells in series is a 3S battery, which provides a nominal 11.1 volts and seems like a convenient choice for powering models with 12 volt motors. That is, until we consider how to safely charge a battery pack in a small model. Not so easy, which is the reason S-CAB does not use battery packs. ​A battery power supply is really an electronic system which combines LiPo cells and electronics to safely manage battery energy storage and utilization. 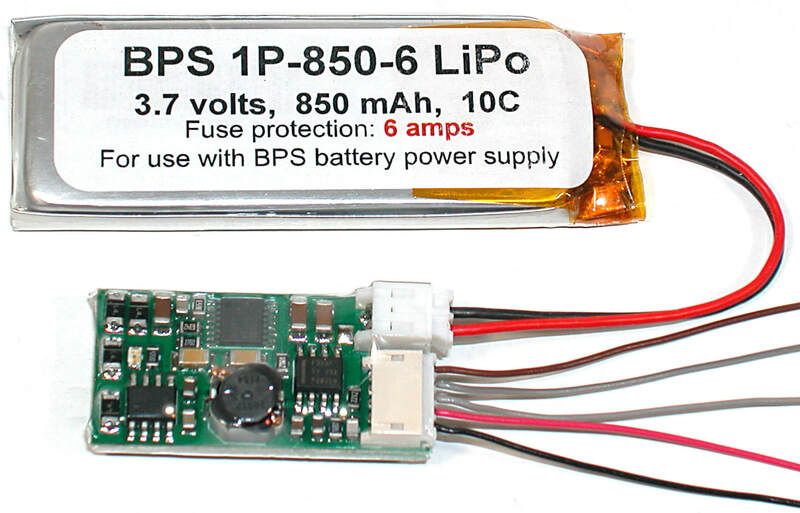 This website deals with a battery power supply (BPS) implemented using parallel-connected LiPo cells. We have a battery (1P, 2P, etc.) but voltages don't add. Energy storage adds, but voltage is always 3.7 volts. S-CAB operates at 916.48 MHz using a radio module developed for remote control. Deltang operates in the 2.4 GHz band using Spektrum technology developed for model aircraft operation. BlueRail uses BlueTooth technology developed for mobile phones and tablet PCs. For brevity, I've ignored a number of variants within the remote control group. When S-CAB was developed 7 years ago, remote control using the 900 MHz radio band was a practical choice. Today, the choice is determined by user preference. There are three basic S-CAB products and several versions of each. ​​BPS combines a battery charger, battery management and a step-up voltage converter in one package. ​This allows a single lithium-polymer cell (LiPo), nominally 3.7 volts, to produce higher voltage required for loco power. Where space is available, cells can be connected in parallel to increase storage capacity. A choice of three cell sizes is available and all BPS batteries include built-in short-circuit protection. In addition, BPS battery management includes over- and under-voltage protection for the battery. The battery switch operates both manually and automatically. ​There's really nothing proprietary about the S-CAB receiver. It's simply a Linx Technologies radio module connected to a commercial DCC decoder such as the sound decoder illustrated to the right. The only thing unique to S-CAB is direct connection of radio receiver data output to the decoder's microprocessor. This keeps the overall package smaller and avoids the inefficiency of alternative methods that waste battery energy by converting radio data to DCC power input in order to use the decoder's left/right track inputs. A wireless, battery-powered, hand-held controller completes the S-CAB system. Communication is direct from throttle radio transmitter to a compatible receiver in the loco to which a command is addressed. Each throttle can manage up to 15 locos during an operating session. The radio transmits at 916.48 MHz, but is only active (approximately 0.04 seconds) while transmitting a command. Consequently, operating sessions with a number of participants and multiple throttles is possible. To date, the maximum is 6 throttles in regular use on a large layout.